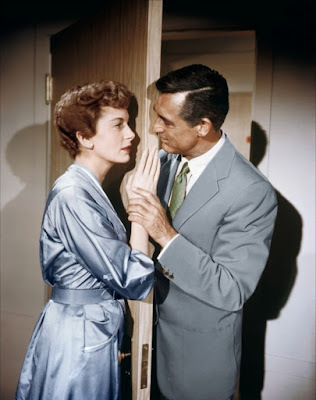 An Affair to Remember (1957), starring Deborah Kerr and Cary Grant, is one of the classic movies airing on TCM this week. Every Tuesday and Thursday in April TCM is featuring movies from some of Old Hollywood's most beloved characters actors. 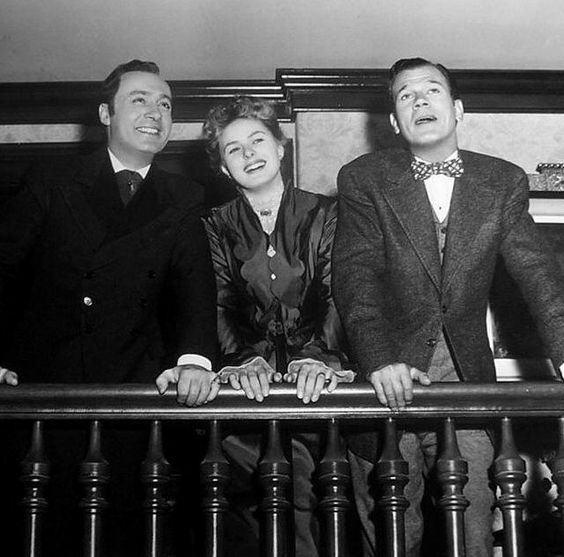 This week's lineup includes such familiar faces as Ward Bond, Marjorie Main, Frank Morgan, and Thelma Ritter. There's also a lineup of classic romances and an evening dedicated to the great actor, Claude Rains. TCM Film Noir Franchise: Director Jules Dassin's Brute Force (1947) at 10 a.m. Sunday finds inmate Burt Lancaster leading a prison escape. Silent Sunday Nights: Two 1922 comedies starring Harold Lloyd. First up is his role as a small-town weakling in Grandma's Boy followed by his role as an altruistic physician in Dr. Jack. Starts at midnight. TCM Imports: Two films from German director Rainer Werner Fassbinder. First is Ali: Feat Eats the Soul (1974) at 2:15 a.m. a drama about the love between a German cleaning lady (Brigitte Mira) and Moroccan shopkeeper (El Hedi Ben Salem) that is a partial remake of All That Heaven Allows (1955). Next is Fassbinder's first film, the gangster saga Love Is Colder Than Death (1969) at 4:15 a.m.
Best Day to DVR: Friday afternoon and evening. There's a great lineup of complicated romances beginning with Joan Crawford as an obsessive housewife in Possessed (1947) at 3:45 p.m. and ending with Crawford as a manipulative Southern matriarch in Queen Bee (1955) at 4:15 a.m. 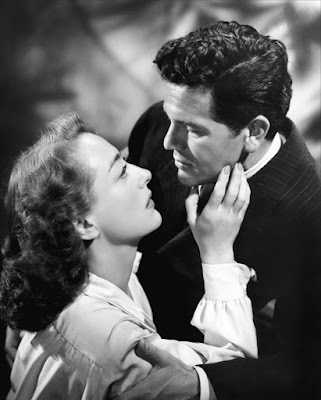 In between, there's another great Crawford performance (Humoresque), the best-known old Hollywood romance (An Affair to Remember), and an intimate masterpiece from director David Lean (Brief Encounter). 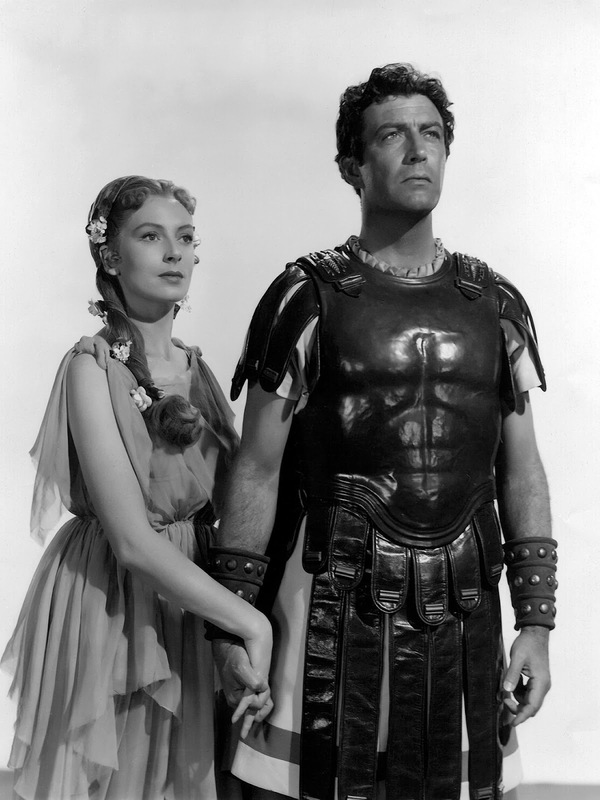 Deborah Kerr and Robert Taylor in Quo Vadis (1951). Three daytime picks: The theme is movies starring Peter Ustinov starting with his memorable performance as Roman Emperor Nero in the Biblical epic, Quo Vadis (1951) at 6:30 a.m. followed by his Academy Award-winning performance in another ancient epic, Spartacus (1960) at 11:30 a.m. Hot Millions (1968) at 5:30 p.m. is a fun caper movie about an inept con artist (Ustinov) and his mousy wife (Maggie Smith). Late night pick: In A Thousand Clowns (1965) at 11 p.m., Daniels plays a social worker who battles with free spirit Jason Robards over custody of his nephew (Barry Gordon). Three daytime picks: The theme is movies about madness starting with Boris Karloff and Anna Lee in producer Val Lewton's atmospheric chiller, Bedlam (1946) at 9:45 a.m. followed by fortune-seeking husband Charles Boyer trying to drive wife Ingrid Bergman insane in the Victorian suspense movie, Gaslight (1944) at 1:30 p.m. A crusading journalist (Peter Breck) gets himself admitted into an insane asylum in director Samuel Fuller's exploitation flick Shock Corridor (1963) at 6 p.m.
Prime time lineup: TCM is featuring movies from some of old Hollywood's best character actors each Tuesday and Thursday. Tonight's lineup features four great gents starting with Ward Bond as legendary boxer John L. Sullivan in Gentleman Jim (1942) at 8 p.m. Next, Frank Morgan gives a sensitive performance as the alcoholic boss of telegraph delivery boy Mickey Rooney in The Human Comedy (1943) at 10 p.m.
Late night pick: Charles Bickford plays a French priest who becomes involved with visions of the Virgin Mary in The Song of Bernadette (1943) at 12:15 a.m. The teenage romance Janie (1944) at 3:15 a.m. is filled with wonderful character actors, including the always imposing Edward Arnold. Claude Rains in The Invisible Man (1933). 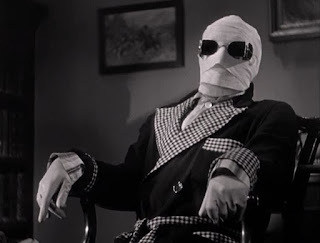 Three daytime picks: The theme is weird science starting with Lon Chaney as a Dr. Frankenstein-like scientist who harvests body parts from car accidents in the silent horror-comedy The Monster (1925) at 6 a.m. followed by Boris Karloff as a 19th-century grave robber in The Body Snatcher (1945) at 10:30 a.m. Finally, Karloff plays Dr. Frankenstein in the low-budget shocker, Frankenstein 1970 (1958) at 6:30 p.m.
Prime time: The prime time lineup is devoted to the thirties films of actor Claude Rains starting with his memorable role as a vanishing scientist in the Universal Pictures horror film, The Invisible Man (1933) at 8 p.m. Stolen Holiday (1937) at 9:30 p.m. finds Rains as a fraudulent financier who romances Parisian model Kay Francis. Late night pick: They Won't Forget (1937) at 1:30 a.m. is a powerful drama starring Rains that is based on a real-life incident that took place circa 1913 in Atlanta. 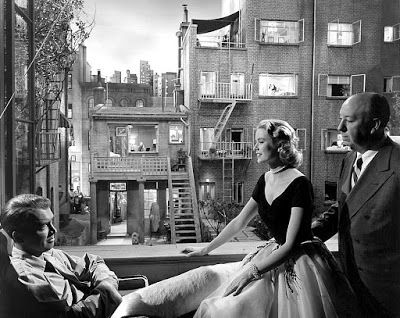 James Stewart, Grace Kelly, and Alfred Hitchcock on the set of Rear Window (1954). Three daytime picks: The theme is films written by pioneering director and screenwriter Frances Marion starting with a documentary about Marion and other women in early Hollywood, Without Lying Down (2000) at 8:45 a.m. During the 1930s, Marion was a screenwriter for MGM movies, including the Greta Garbo film Camille (1937) at 1:45 p.m. and the all-star comedy Dinner at Eight (1933) at 5:45 p.m.
Prime time lineup: The character actors continue with four grand dames starting with Florence Bates as Vera-Ellen's formidable ballet instructor in the musical On the Town (1949) at 8 p.m. Mary Wickes plays the sassy maid of a small-town Indiana family in the musical By the Light of the Silvery Moon (1953) at 10 p.m.
Late night pick: The always endearing Marjorie Main plays a fellow RVer in the Lucille Ball-Desi Arnaz road-trip comedy, The Long, Long Trailer (1954) at midnight. TCM fan favorite Thelma Ritter plays James Stewart's sarcastic nurse in Rear Window (1954) at 2 a.m.
Three daytime picks: The morning lineup is devoted to eight movies featuring crime-solving reporter Torchy Blane (played by both Glenda Farrell and Lola Lane) starting with Smart Blonde (1937) at 6 a.m. and ending with Torchy Runs for Mayor (1939) in 2:30 p.m. The afternoon lineup features postwar romances starting with TCM fan favorite Dear Heart (1964) at 5:45 p.m.
Prime time lineup: The romances continue in prime time starting with the all-time classic An Affair to Remember (1957) at 8 p.m. followed by director David Lean's bittersweet romance about forbidden love Brief Encounter (1945) at 10:15 p.m.
Late night: Joan Crawford gives one of her best performances as a married socialite who falls for violinist John Garfield in Humoresque (1946) at midnight. The prime time lineup is all about U-boats movies with Robert Mitchum and Curt Jurgens as battling World War II captains in The Enemy Below (1957) at 8 p.m. Merchant Marines Raymond Massey and Humphrey Bogart fight off Nazi subs in Action in the North Atlantic (1943) at 10 p.m. The World War I thriller The Spy in Black (1939) at 12:30 a.m. was the first collaboration between directors and screenwriters Michael Powell and Emeric Pressburger. The prime time lineup features two movies about radio personalities. During the 1930s, 1940s, and 1950s radio commentators like Arthur Godfrey and Walter Winchell wielded a great deal of political influence, much like cable new commentators in 2017. First up is Jose Ferrer in The Great Man (1957) at 8 p.m., which is based on Godfrey's controversial career. Next, Burt Lancaster gives a career-best performance as a Winchell-like radio host and newspaper columnist in the noir, Sweet Smell of Success (1957) at 10 p.m.